Well, what a week that was! The start of September is dConstruct time here in Brighton—one of the focal points of Clearleft’s calendar. Things get hectic in the office in the days and weeks beforehand. Then Brighton becomes the centre of web geekdom for a few days. Things got rolling with a few workshops, one of which this year was my HTML5 For Web Designers workshop. I think it went pretty well. I was walking from the workshop venue (Lighthouse) into town to meet up with Jessica—we were going to see Anthony Bourdain speak in his inimitable, somewhat gauche way. As I was strolling along, a young man approached me. He was carrying a small package. Excuse me , he asked. Are you Jeremy Keith? I determined that he was an unlikely hitman and anyway, I had committed no crimes grievous enough to warrant a contract on my life, so I answered in the affirmative. 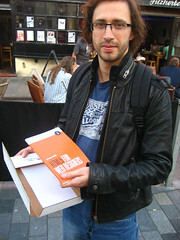 It turned out that the package in his hands was a delivery from A Book Apart. He wanted to know if I would sign the contents of the package. 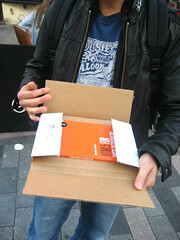 I agreed on the condition that we document the unboxing right then and there in the street. That doesn’t happen very often. That was a pleasant start to an excellent few days. The geeks began to arrive in Brighton from far-flung destinations: Brian from Iceland, Tantek from California, Andy from Belfast. From Belgium, they came. From Portugal, from France. It was like a little mini South by Southwest …or South by Southwest as it used to be a few years back before it mushroomed in size. The day itself was wonderful, really wonderful. I know I’m biased and I’m bound to say that, but really, I think this may have been the best dConstruct yet. I had the honour of introducing the speakers. I thought I might be quite nervous about that but actually, I had a lot of fun. The quality of the speakers and their talks was astoundingly high so I simply spent the day wallowing in the excellence and occasionally exclaiming How cool was that? or words to that effect. Such a great line-up! It felt great to introduce John Gruber for the first time in the UK. Finally meeting Merlin Mann was a real pleasure—his affable, off-the-cuff talk sans-slides was hilarious. And I’m particularly happy that the audio from Hannah’s presentation is available. She started with a little bit of a musical number, playing her cello with myself on mandolin and Matt on piano. I think it sounds pretty good. 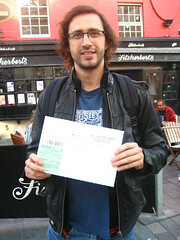 But the highlight for me was James Bridle. 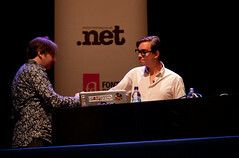 I don’t just mean it was the highlight of dConstruct; it was one of the finest presentations I’ve ever seen anywhere. Ever. …mark my words: when this year’s dConstruct is done, his talk will be the one that everyone will be talking about at the after-party. He didn’t just fulfil those expectations, he surpassed them. His thoughts resonated with my own obsessions but he took things to a whole new level with a physical piece of data visualisation that he constructed. You can get the details of the artefact on his site, where he writes On Wikipedia, Cultural Patrimony, and Historiography. dConstruct 2010 wrapped up with my mind well and truly blown. Did you have a nice day? by Rattle: a gorgeous SVG visualisation of the team’s experience on the day. Source code included.